Having first collided on record 3 years ago via Rocket Recordings ‘Drop Out With…’ LP, two of the most colossal cosmic manglers on the planet, New York’s White Hills and Manchester’s GNOD, head to Sheffield for a blistering night of rabid fuzz and reality bending repetition. 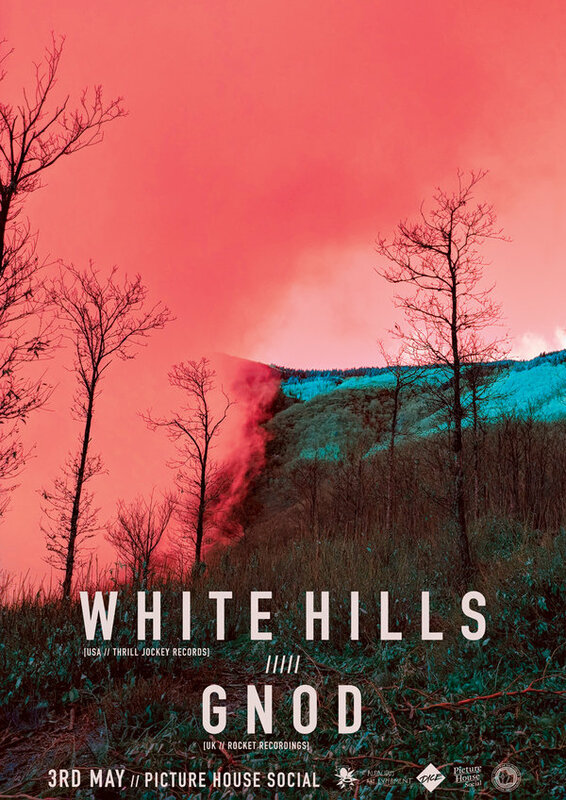 White Hills are proponents of psychedelia as transformation. Hard-line, gritty, and intellectually engaged, the music made by Dave W. and Ego Sensation is risky and cutting edge, rooted in dystopian futurism and hyper-conscious of society’s constant desire for a new and better drug. Formed in New York in 2005, they are known for being one of the most prolific bands of their generation, recording over 40 separate releases including 7 full-length studio albums. Having continually refined their sound, pushing the boundaries of psychedelic music, their latest album ‘Stop Mute Defeat’, released on Chicago’s Thrill Jockey Records, is a brazen, industrially-charged nod to greats such as Throbbing Gristle and Cabaret Voltaire. Pulsating unlike anything they’ve released before. The band’s relentless touring of both the US and Europe has gained them a following worldwide, commanding stages both gargantuan and intimate. This stop off at Sheffield’s Picture House Social will be no exception. GNOD’s musical trajectory has been one of constant fluctuation borne out of an incessant need to discover new sonic worlds. Beginning life as a shamanic drone ensemble, at times fitting up to 15 members on stage, these early rituals informed the core ideals that have come to define the group in their years of activity; community and trance-inducing repetition. Throughout a discography that has amassed dozens of CD-R’s, cassettes and vinyls for labels like Rocket Recordings, Trensmat, Krokodilo (Blackest Ever Black) and their own Tesla Tapes imprint, a restless yet organic need to mutate their music into new realms has had critics clawing for comparative touch stones. It is the exact same dedication to the live arena that has seen GNOD become one of the most celebrated live bands in the UK. Offering a gateway to an aural black hole and along with firm guiding hand, the opportunity to dive head and body first into a powerfully new psychedelic maelstrom full of possibilities.